It's that time of year again. Time has fallen back. Leaves are changing and dropping to the ground. Hoodies are out. Bonfires are burning. But most importantly, the pie begins to flow like wine. Simply put, I’m a pie guy. It has always been so. As a boy, I was the kid who asked for pumpkin pie instead of birthday cake. To this day, I use the question “Cake or Pie?” as a compatibility test for any and all kinds of relationships. It’s not that I have a problem with cake, but pie is just the right answer. Point of fact, it was one of my opening lines at the beginning of Emily and my relationship. She responded “Pie, duh.” Fireworks ensued. So, with Thanksgiving quickly approaching, we thought it best to take our time to seek out some of the best pies in Kansas City. We chose six locations and tried two different pies at each spot. They were selected with two simple questions. What is your signature pie? And what pie on your menu is the most underappreciated? Follow along for their delicious suggestions. 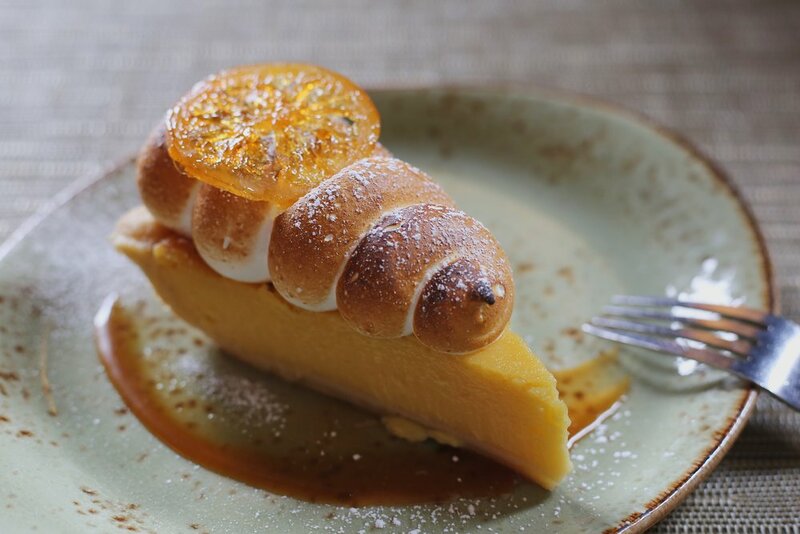 Signature: Lemon Meringue- This pie was especially sweet and tart. It definitely had the finest presentation of any we ate. The meringue was more like marshmallow than airy. The crust felt like you were eating a crumbly lemon bar. The filling was dense, reminding us of the consistency of other custard-based pies. The major thing that stood out to us was that they place the meringue for each individual slice, then toast it like a crème brulee. Let it be known. We agreed this was the best lemon meringue pie we’ve ever had. Making it as rare as the unicorn horn, of which, this lightly toasted meringue most resembles. Most Underappreciated: Mokan- This was unlike any pie I’ve ever had, as the focus was really on the nutty flavor. It wasn’t sweet or how you would traditionally envision a pecan pie. It had both pecans and walnuts in it, along with a brown sugar filling. It was very mellow and subtle, with a nice buttery crust. All of the nuts were locally sourced from both Missouri and Kansas. Which we thought was pretty cool. Hence Mo…Kan. See what they did there? Signature: Harvest Apple- First off, this place smells like butter. This is not a criticism. Merely a fact. Upon entry, we became very excited. With both pies selected, one of the co-owners, Elaine, suggested that we indulge a la mode. This was the only establishment to offer that as their preferred method of consumption, and how she would do so herself. This was without a doubt, one of the cuter pies we ate. They weren’t serving the apple by the slice, so they provided us our own mini-pie. It had a nice chewy, but crunchy top crust. It almost felt caramelized! There was a nice amount of spice to it that didn’t overpower the apple flavors. The apples were cut into very thin slices, which was different than most apple pies I’ve experienced thus far in my short time on this Earth. Most Underappreciated: German Chocolate- This chocolatey goodness, which I didn’t even know existed, was the direction we were pointed for most underappreciated. Similar to the apple, it was served warm with a single scoop of delicious vanilla ice cream and some powdered sugar. There was an abundance of coconut on this one, lots of pecans and walnuts, and we really enjoyed the little aluminum trays with gingham paper. Made it feel like a nice throwback. The combination of the ice cream and the pie really reminded me of eating a gooey brownie sundae, which was decidedly different than the other German chocolate pie we tried. You’ll read about this later. I hope. Keep reading…there’s more good stuff. Signature: Banana Split- This. Pie. Was. Elaborate. So many things going on! It had bits of strawberry, banana slices, and pineapple, all in a banana and vanilla custard filling, topped with a heaping portion of whipped cream, decorated with chocolate drizzle, pecan chunks, and a single cherry. One thing that really stood out to us was the crust on the bottom. It was like a pecan sandy shortbread cookie. Roll up your sleeves on this one. It is decadent and they provide a very generous portion. Most Underappreciated: Pumpkin- The manager picked this one because he said he was always surprised how little it sells at this time of year, given pumpkin’s popularity in all other forms. We figure most people are just waiting for Thanksgiving and banking on homemade. This pie was very spice forward. You tasted the cinnamon and nutmeg more than the pumpkin flavor. It was a dense slice, and had very good consistency. Probably the strongest pumpkin pie we’ve had other than homemade. Signature: Coconut Cream- A classic pie in a classic diner. You can’t do much better than that. Lots of coconut shavings in this one. A thick plop of whipped cream on top and nice thick crust on the bottom. The soft, satisfying crust was a great way to finish. A good ol’ fashioned pie, served on a chilled plate. Which we thought was a nice touch. Most Underappreciated: Strawberry Cream- Another creamy one, with lots of sugary, strawberry goop atop. So much in fact, that it kind of overshadowed the cream. We preferred the coconut over this one, but it was good. Reminded me a little of strawberry shortcake. The portions were decent, but not overwhelming. I didn’t feel too gluttonous with these pies. The real struggle was just going for pie and not grabbing a burger and fries too. So don’t do that. Get in there and treat yo’ self. Signature: Raspberry Rhubarb- Ashleigh’s is a particularly memorable place, as it is in Pryde’s Kitchen and Necessities, located in Westport. It’s just Ashleigh and one other person, knocking out delicious baked goods starting at four in the morning each day. This pie was also very tart, but not overwhelmingly so. It had a nice crispy, crunchy crust, and you could actually see the little grains of sugar that adorned its latticed top. The bottom crust was equally satisfying, making it our favorite crust of all the pies we consumed in our travels. Overall, a very strong pie. Most Underappreciated: German Chocolate- This pie was very rich and dense, almost like a chocolate mousse. Whereas Upper Crust’s felt like a gooey sundae, we agreed this was more like the perfect marriage between chocolate crème pie and a traditional brownie. It was topped similarly to a traditional piece of German Chocolate Cake, which really just added a nice texture to it, and only a light coconut flavor. If you find yourself wanting to meander from the specific suggestions Ashleigh provided us, we recommend the cherry crumble. ‘Twas dope. So, by the end of our journey, we had a pretty cool opportunity to try a smaller, up-and-coming bakery. It is currently run out of the owner’s home and made with recipes that have been passed down for five generations– a feat not many can claim. Most families just consume pies for five generations. They’re looking to move into a store in the spring of 2018. We had the opportunity to sample a variety of her “poppers,” the smallest of the four sizes of pies they have available. Across the board, we thought the crust was their strongest attribute. It reminded us of shortbread. It was thick and buttery, and crumbled nicely. We also really enjoyed the homemade whipped cream, which topped several of the poppers we were provided. In particular, it was best with the chocolate cream. They directed us to their cherry and blueberry for their signature pie. It was stocked with whole blueberries, which complemented the traditional cherry flavor. There may not be a place you can visit right now, but she is definitely worth checking out. 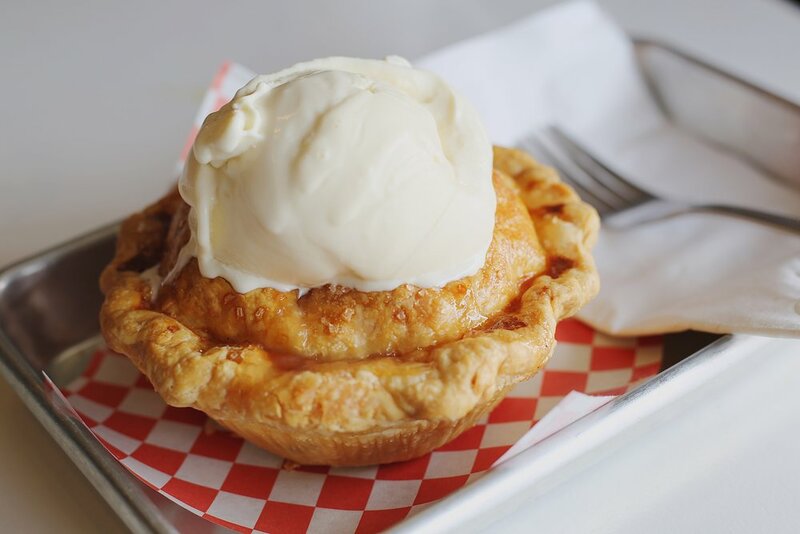 Be on the lookout for Mama Hopper's once it opens its store location next year, but in the meantime, pies can be made to order by contacting the owner at julie@mamahoppers.com.